The Virginia Fusion Center (VFC) has observed via open sources that actors affiliated with the Anonymous hacktivist movement released a video which purportedly identifies a Chicago Office of Emergency Management and Communications (OEMC) vehicle as a tool for law enforcement wiretapping efforts by police and fusion center personnel in Chicago, Illinois. 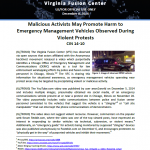 The VFC is sharing this information for situational awareness, as emergency management vehicles operating near protest areas may be targeted by precipitating violent or malicious activity. 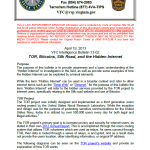 The purpose of this bulletin is to provide awareness and a basic understanding of the “Hidden Internet” to investigators in the field, as well as provide some examples of how the Hidden Internet can be exploited by criminal elements. While the term “Hidden Internet” can be used in a broader context and refer to other internet terms such as the “Deep Web” or “Deepnet,” for the purpose of this bulletin the term “Hidden Internet” will refer to the hidden services provided by the TOR project to internet users, specifically relating to the Silk road website and use of Bitcoins. Court documents related to the U.S. government’s efforts to force Lavabit LLC, an encrypted email provider used by Edward Snowden, to hand over encryption keys to decode all secure traffic flowing through the site. The documents were originally obtained and released by Kevin Poulsen of Wired.com after being unsealed by a judge on October 2, 2013. Criminal complaint against Amine El Khalifi, a Moroccan man accused of attempting to bomb the U.S. Capitol building. The complaint was filed February 17, 2012. 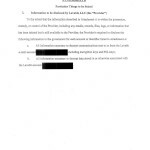 Criminal complaint in the case of United States of America v. John Kiriakou, a former CIA officer who reportedly leaked classified information to reporters regarding the waterboarding of Abu Zubaydah. Mara Salvatrucha 13, or MS-13, is a transnational, mainly Hispanic, street gang notorious for its adherence to a methodology of extreme violence to enforce fear and establish street credibility. MS-13 diverges from the traditional American street gang model in that it maintains cross border organizational ties, and currently poses a serious threat throughout Central America, Mexico, and Canada, as well as domestically in the United States. In Virginia, the influx of Salvadoran immigrants to the Washington. DC metro area has created the second domestic center for the gang’s American presence. 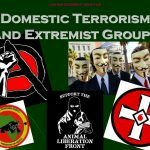 Membership has been documented across the National Capitol Region and in central Virginia, making it the major gang threat to Northern Virginia and a major concern for the Commonwealth as a whole. Demographic change in the Commonwealth, combined with the potential expansion of MS-13 membership to non-Hispanic individuals, constitutes a serious potential threat to public safety. 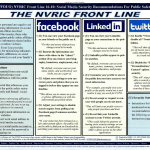 Virginia Fusion Center (VFC) Overview Brief, April 22, 2009. The purpose of this Threat Assessment is to convey potential threats to educational facilities and related assets in the Commonwealth of Virginia in order to prevent terrorist and insider attacks as well as to increase awareness regarding available threat information. It is anticipated that this assessment will assist homeland security personnel in understanding the potential vulnerabilities to public and private schools, colleges, and universities in order to further assist in responding effectively to an educational facility-related incident. This assessment describes insider threats as well as those posed by domestic extremist and international terrorist groups. The Bloods street gang has become one of the most violent and notorious criminal organizations, spreading its influence in the U.S. from coast to coast. A traditionally African American gang, Bloods membership today includes Caucasians, Hispanics, and Asians. Blood members are involved in a variety of criminal activities including murder, assault, robbery, and narcotics distribution. Nationally, gang membership in the Bloods has been estimated between 15,000 and 20,000 members.1 Blood sets range from highly organized and structured groups similar to the Italian Mafia to loosely organized cliques with little discipline and loyalty. The Bloods have grown in popularity over the years thanks in part to the proliferation of music, movies, and television shows glorifying the “gangsta” lifestyle as well as social networking sites and the vast amount of information on the gang available on the Internet. Current intelligence gathered by the Virginia Fusion Center and other law enforcement agencies indicates the Bloods are a significant criminal threat to the Commonwealth and will continue to grow in numbers and operational scope. The Commonwealth of Virginia’s Pandemic Influenza Plan addresses the Commonwealth’s response to and recovery from a pandemic influenza in a comprehensive and coordinated manner to ensure essential services across all sectors of state government can be maintained throughout the event period, which may last as long as 18-24 months. The Virginia Department of Health (VDH) developed an Influenza Pandemic Plan (Health Component) in 2002, which was subsequently updated in 2006 and 2007.